TRAFFIC ADVISORY: 400 block of N Rexford Drive closed today at 3:30PM til approx 10PM for National Night Out event. Please be advised that the 400 block of N Rexford Drive will be closed today at 3:30PM until approximately 10PM for National Night Out event. 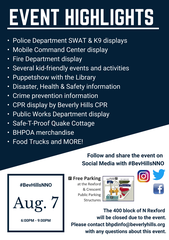 We are turning the 400 block of N Rexford Drive (in front of the Library and BHFD) into a Beverly Hills block party! 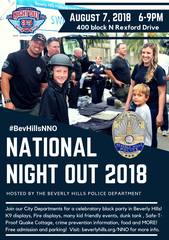 Please come and join the Beverly Hills Police Department, Fire Department, Public Works, Community Services, Library and other City Departments for this night of displays, kid-friendly events, and more, starting at 6PM and concluding at 9PM. Access in and out of parking structures will still be possible.